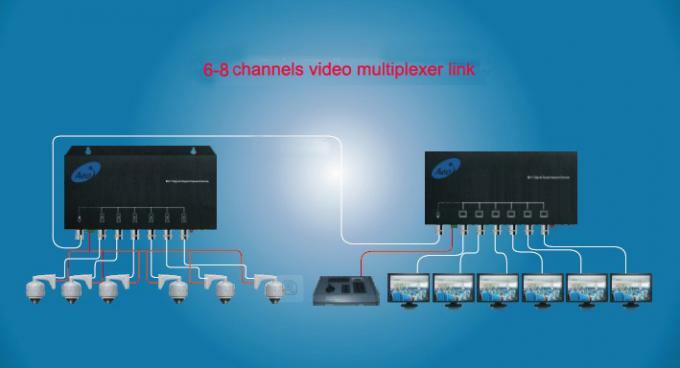 Video Multiplexer over Coax & Signal Superimpose Device is mainly for increasing monitoring points in the video surveillance system, and the transformation of the old project or the difficult construction. 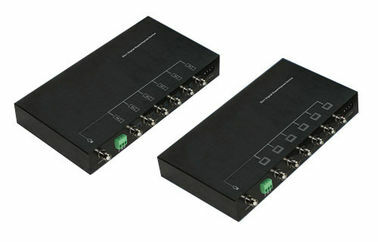 Using frequency reuse and signal superimposed technology makes 1 channel 485 control signal (alarm signal, audio signal) or a video signal superimposed onto another 1 channel video signal transmission with a video coaxial cable. You can use the original video coaxial cable for the expansion of the surveillance cameras which could save wire construction and reducing the difficulty of construction transformation of the old engineering projects. Making six video signals superimposed on a video coaxial cable using frequency-shift technology to transmit forward or reverse video, audio, switch, alarm signal. Apply to a static point changing to fixed point or a fixed-point increasing audio, increase the alarm, or adding background music function in old reconstruction project.